Life Before the Dinosaurs: Schinderhannes bartelsi. 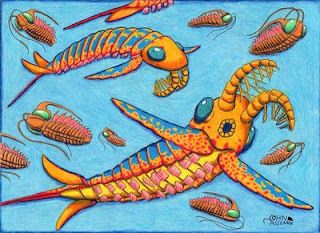 Schinderhannes bartelsi was an anomalocarid from the early Devonian. It was 10 cm long. 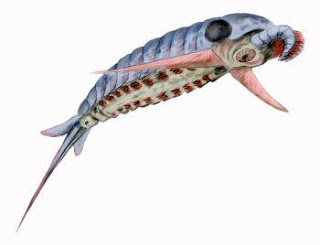 It propelled itself through the water with the two paddles on the head, and steered itself with the smaller paddles near the spine at the posterior end. Schinderhannes bartelsi had eleven armored segments which had gills on the bottom. Schinderhannes bartelsi is known from one specimen from Germany. Schinderhannes bartelsi probably hunted trilobites and ate them just like its relative Anomalocaris from the Cambrian and Ordovician periods. I'm pretty sure I rmemeber that name from Soccer Made in Germany (Channel 36 in the 80s). Forgot about this important find thanks for the info, love your analysis, short and descriptive. Your blog is AWESOME! I loved hunting for fossils from this period when I was your age. Please, keep reminding me of how cool these creatures were! I would definitely love to find fossils of life before the dinosaurs because most of the stuff only lived in Paleozoic and Proterozoic eras. I really do think all those amazing animals are really cool!!!! !